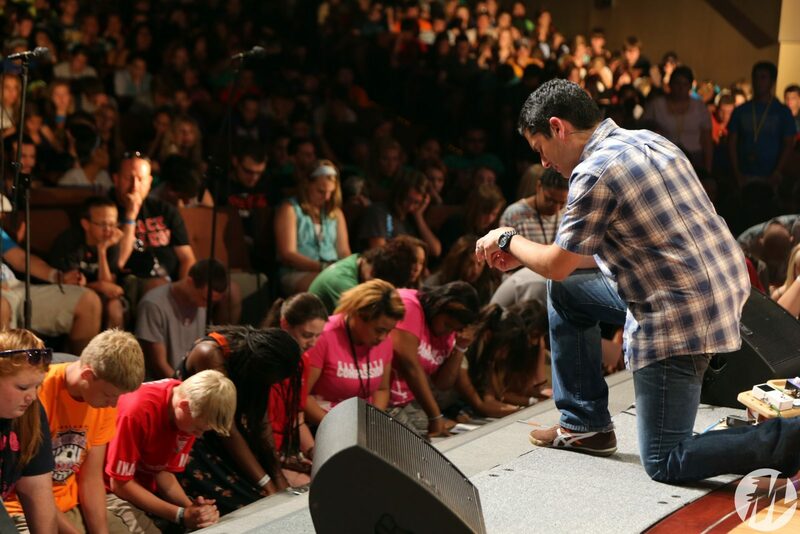 Momentum speaker, Afshin Ziafat, prays with students following his presentation. From beginning to end, “I am Second” was not just a theme at the 2013 Momentum Youth Conference. It was taught from the platform, practiced in needy communities around the host campus, and lived out in the lives of speakers, youth leaders, volunteers, and others. Nearly 2,000 students, youth workers, volunteers, and others came from 14 states and provinces in North America. They came from as far away as British Columbia, the western United States, and Florida. They came to hear speakers like Francis Chan, Derwin Gray, Afshin Ziafat, Sean McDowell, Jim Brown, Keith Minier, Clayton King, and Jeff Bogue. God used those men to move hearts. Hundreds of young people made decisions for Christ — for the first time or to serve him with their lives. Afternoons were packed with Your Day Your Way opportunities — sports tournaments, musical competition, Bible quizzing, and other activities. A Friday night offering resulted in $34,870 that will help financially needy students attend youth conference through the LIFE program (Low Income Financial Encouragement). In addition, a donor has agreed to match gifts up to $25,000 in order to provide the scholarships. LIFE will provide scholarships to future Momentum conferences for students from impoverished areas. “We invited God to be here and I believe he was here,” said Ed Lewis, executive director of CE National. In 2014, Momentum heads to the Chicago area as the conference will be held July 22-27 at Wheaton College in Wheaton, Ill.
See more photos from Momentum at buildmomentum.org. This article first appeared in the Fall 2013 issue of GraceConnect magazine. Click here to sign up for your free subscription.